The creation of the Frankfurt School of critical theory in the 1920s saw the birth of some of the most exciting and challenging writings of the twentieth century. It is out of this background that the great critic Theodor Adorno emerged. His finest essays are collected here, offering the reader unparalleled insights into Adorno's thoughts on culture. He argued that the culture industry commodified and standardized all art. In turn this suffocated individuality and destroyed critical thinking. At the time, Adorno was accused of everything from overreaction to deranged hysteria by his many detractors. 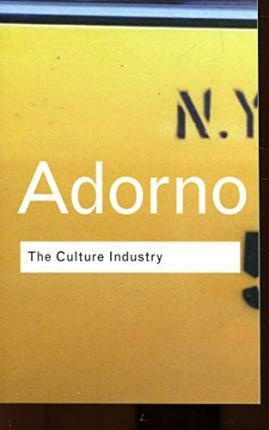 In today's world, where even the least cynical of consumers is aware of the influence of the media, Adorno's work takes on a more immediate significance. The Culture Industry is an unrivalled indictment of the banality of mass culture. "A volume of Adorno's essays is equivalent to a whole shelf of books on literature." "Adorno expounds what may be called a new philosophy of consciousness. His philosophy lives, dangerously but also fruitfully, in proximity to an ascetic puritanical moral rage, an attachment to some items in the structure and vocabulary of Marxism, and a feeling that human suffering is the only important thing and makes nonsense of everything else ... Adorno is a political thinker who wishes to bring about radical change. He is also a philosopher, with a zest for metaphysics, who is at home in the western philosophical tradition."